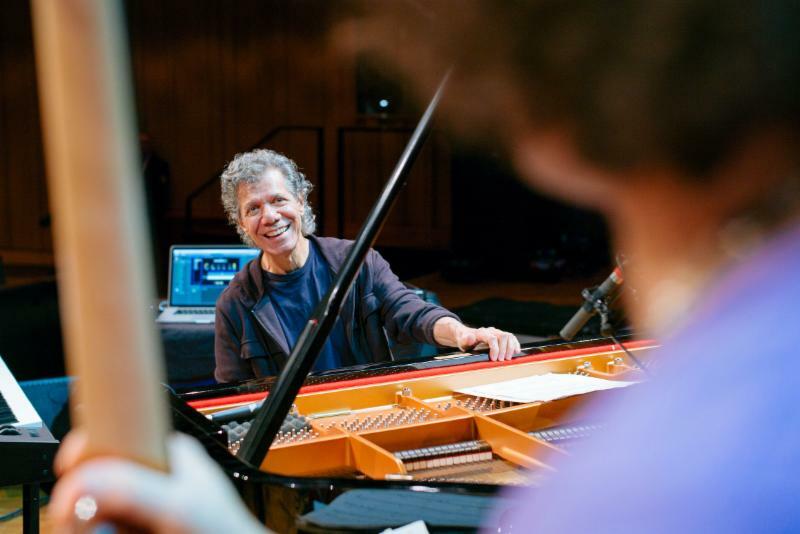 Music legend Chick Corea is spending his 75th birthday at home: on the road. Corea has spent 50 years on the world's most venerated stages, playing with a pantheon of fellow-traveling musical compatriots, and now he's packing it all into one year. For 2016, he's lined up an Iron-Man marathon of tour dates, literally circling the globe: Phoenix to Minneapolis to Naples to Stuttgart to Tokyo to Beijing to Honolulu and back to LA. This activity will lead up to the greatest jazz birthday party ever: an unprecedented two-month residency at New York's Blue Note Jazz Club this fall, where Chick has assembled an unprecedented lineup of giants to do what they do best: create music magic, two shows a night, for eight straight weeks. But it all started in April, which opened with Chick at the star-studded International Jazz Day concert, broadcast nationwide from The White House lawn. An East Coast duet tour with Béla Fleck preceded a solid month of shows in Japan with fellow pianist Makoto Ozone-including two nights with the NHK Orchestra in Tokyo playing Mozart's "Concerto for Two Pianos and Orchestra." July brought European concerts with the all-star "Homage to Heroes" quintet, featuring Wallace Roney, Kenny Garrett, Christian McBride and Marcus Gilmore. The past week at Catalina Jazz Club in Hollywood - ask any Chick fan - has been a long time coming: the Chick Corea Elektric Band returned, (Aug. 17-24) for a celebratory 7 nights and 14 sold-out shows at the iconic Hollywood club, which has hosted many legendary Corea performances. The classic lineup is in force: Corea, Dave Weckl (drums), John Patitucci (bass), Eric Marienthal (sax), Frank Gambale (guitar). The Elektric Band will also do a handful of U.S. theater dates in October, and kickoff Chick's landmark residency at the Blue Note New York. An Italian excursion in September finds Chick renewing his legendary lifelong duo conversation with vibraphonist Gary Burton, including headlining La Villette Jazz Festival in Paris. In the run-up to the Blue Note Celebration, Chick has managed to fit in three different configurations of his Trilogy trio: Following US performances in June and July with the GRAMMY®-winning band with Christian McBride (bass) and Brian Blade (drums), including performances at the Newport Jazz Festival where Chick was named Artist of the Year, younger firebrands Avishai Cohen (bass) and Marcus Gilmore (drums) join Chick for appearances in September in Israel, Kiev, and more throughout Europe and Asia. The trio will headline the grand opening of the Blue Note Beijing on Sept. 13. The legendary Eddie Gomez (bass) falls in with Corea and Blade for a residency at the Blue Note Hawaii (Sep. 21-24) and the San Francisco Jazz Festival (Sep. 29 - Oct. 2), plus West Coast concerts in September and October. Back in his musical home, New York City, the Blue Note residency (Oct. 19 - Dec. 11) is the kind of honor and celebration befitting a career like Corea's: 22 GRAMMY® wins. NEA Jazz Master. Downbeat Magazine Hall-of-Famer. An artistic voice that has influenced and been inspired by countless musical traditions: modern jazz to traditional flamenco, western classical to electric jazz-fusion, acclaimed solo performances to many high-profile collaborations. All the facets of his restless creativity will be on display at the Blue Note, in 80 shows with 60 iconic musicians playing in 15 bands (see bluenotejazz.com for a detailed listing). These include a tribute to his mentor Miles Davis with other Davis alumnae; a week with longtime partner-in-crime and drum legend Steve Gadd; two nights of experimental electronica with drummer Marcus Gilmore and guests; and the return the Flamenco Heart. The Harlem String Quartet will join the simpatico duo partnership with Gary Burton. Perennial fan-favorite projects with Origin and the 15-piece Trodheim Jazz Orchestra will also occupy the Blue Note stage, plus a three-night series of duets with pianists yet to be announced. The final two weeks of the run will feature the music of Return to Forever and more in two different contexts: the acoustic lineup (Nov. 30 - Dec. 4) includes Ravi Coltrane (sax), Hubert Laws (flute), Avishai Cohen (bass) and RTF drummer Lenny White; an electric band (Dec. 8-11) dubbed Return to Forever Meets Mahavishnu, featuring fellow legend John McLaughlin on guitar, bassist Victor Wooten and drummer White, will also delve into some classic Mahavishnu Orchestra material. Corea's 2016 tour schedule is a shorthand sketch of his entire musical life: a virtuosic summary of 50 years of creativity, and a confident step toward exciting new possibilities for the future.